Chicago Bicycle Accident Lawyer | Illinois Bicycle Lawyers at Keating Law Offices: Chicago Bans "Biking While Texting"
Chicago Bans "Biking While Texting"
The City Council’s Committee on Pedestrian and Traffic Safety passed an ordinance on Monday, October 03, 2011, banning Chicago bicyclists from talking and texting on their cell phones while riding their bikes. The ordinance includes a escalating scale of fines. Bicyclists who violate the ordinance will be fined $20-$50 for their first-time offense, which rises to $75-$100 after the third offense. If the distracted bicyclist is determined to be the cause of a crash, the fine increases to $500. Illinois and Chicago lawmakers have targeted cell phone distractions as it is a growing safety issue. Last year, an Illinois law took effect which banned talking and using cell phones from viewing any “electronic messages” on motorists’ cell phones, which bans not only texting, but also instant messages, e-mailing, or accessing an internet site. The Illinois legislature carved out exceptions for emergency use and hands-free phone technology. 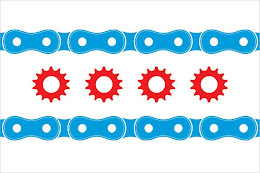 The Chicago biking ordinance also allows Chicago bicyclists the same emergency use and hands-free phone exceptions. The Illinois distracted driving law was passed after the tragic story of Matthew Wilhelm. In 2006, Wilhelm, known as a particularly safe bicyclist who always wore his helmet, was riding his bicycle on the right shoulder of a road when he was struck by a motorist. That motorist, a teenager who was busy trying to download ringtones onto her cell phone, drove onto the shoulder and struck and killed Wilhelm. The next year, an Illinois legislative task force was formed to study the problem of distracted riving. The task force reported that it found that distracted driving causes 1 in every 4 accidents in the United States. That figure reportedly amounted to 4,300 distracted-driving accidents per day. Chicago Alderman Marge Laurino (39th Ward) advocated for the importance of the law to extend to bicyclists, arguing that bike riders need to follow the same rules of the road as motorists. Last year there were more than 1,600 crashes involving bicycles and five people were killed, according to Deputy Transportation Commissioner Luann Hamilton. This blog post was written with the assistance of Joel Barker, a recent graduate of DePaul University's College of Law. Mr. Barker will be admitted to the Illinois Bar in November. Source: Chicago Tribune's "Red Eye" newspaper 10/6/2011.